Your BlackBerry helps you make money in business. Your BlackBerry also helps take money away from you with your carriers data plans. Easy come, easy go. Why not have your BlackBerry help you keep tabs on your money, as it enters and exits your bank? Your BlackBerry is designed to make your day-to-day easier right? Sure, you can juggle your wallet, bank card while tele-banking, but there’s no fun in that. While TV informs us that the iPhone has numerous Bank applications, you and I both know that, we users are far from powerless. If you are standing in line at your bank while reading this, you might as well step out of it now. This article is the first of a two part series of articles that will serve as the ultimate guide to BlackBerry Banking. As time goes on, we will be adding more and more apps and launchers as they are developed. For now, put your wallet in my hands, seriously. To make things easier for you, we’ll separate these apps and launchers by Country. Please note that part one will focus on apps and launchers supported by financial institutions. Third party apps will be minimized. This institution has both an app and a launcher rolled into one package; simply named TD. It allows you to access the mobile site to perform various transactions, as well as offering one-touch calling to the TD Waterhouse Investor Service Centre, or even to a TD Insurance specialist. Branch or ATM locations are presented to you based on your location within your carriers network. Scotiabank has two options available; First, the Branch and ABM app allows you to use your GPS-enabled BlackBerry to find branches and ABM locations. You can also map the location, view their hours and call directly from the application. Second, Scotiabank customers can sign up for Scotia InfoAlerts. You can keep informed of account balances, limits, activity, transactions and more; all from a text message or email. While I’m not a CIBC customer, I still think I have the right to complain. We can see in the media that CIBC has a fully functional iPhone app. We are not necessarily left in the dark- CIBC has given BlackBerry users a mobile launcher, where they can access the mobile site to perform various account transactions (transfers, bill payments), view balances & transaction history and find branch/ABM locations. The app from ING Direct will help you continue to “save your money”. This app also provides options that include account balances, transactions, money transfers and enables you to find ING Direct Save Your Money Cafés (United States) and ABM locations. This is another app and launcher in one. It serves to provide the nearest branch location and grants direct access to Bank of America’s mobile site. Please note that customers in WA or ID do not have access to mobile banking. The ING Direct appfunctions just like the ING Direct Canada application. ING Direct also has an ING Direct ATM Finder application that allows you to find 35000+ Allpoint ATMS, by address or by GPS location. KeyBank customers can use the Key Mobile Banking launcher to find locations, contact customer service or manage their bank accounts- all via the KeyBank mobile site. The MeriWest app helps customers search through over 28000 free to use ATMs, by using a ZIP code or address. You can also view maps, directions, hours of operation and contact information (one click calling). Mobile banking services are also supported. Chase is another situation where iPhone users get an amazing application and BlackBerry users get a mobile launcher. Their mobile site offers branch/ABM locations, account management, FAQs and contact information. M & I Bank (Marshall and Ilsley) offers their online customers a launcher for their mobile site. Access their mobile site in order to fid the nearest ATM, make payments, transfer funds and view balances/transactions. The MobileBanking application supports over 3700 financial institutions in the United States (SunTrust, AF Bank Group, etc). With each of these institutions, you can pay bills, make transfers and so on. Banorte is one of the main banks in Mexico and also the main subsidiary of Grupo Financiero Banorte. The Banorte Movil app not only helps customer manage their history and transactions, but they can also pay towards their mobile phone account. In the UK, a number of financial institutions have registered with Monestise, so there customers have a mobile solution. The app is called Mobile Money Manager. The application can handle transfers, real-time statements and balances, history, mobile phone top-up and international payments. A text service is also available, giving you information that includes; card activation, balance alerts and overseas transaction alerts. The following banks are supported: first direct, HSBC, Lloyds TSB, NatWest, RBS and Ulster Bank. La Caixa is one of the major savings banks in Catalonia, with more than 5500 branches. The CaixaMovil laucher goes above and beyond what most Bank launchers do. In addition to branch/ABM locating and financial tracking, customers can also check out the stock market and purchase tickets. The Group includes Banco Herrero and Solbank. SabadellAtlantico is an app and a launcher. You can use the GPS on your phone to track down the nearest branch or ABM. You can also use it to access your account online, contact a customer service agent, block a card and check the stock market. Banco Pichincha is a full bodied application that covers account management, news, and cellular topups. The Banca Movil Banco de Bogota app lets you handle inquiries, payments and transfers. This app is only available in Spanish. Itau Personnalite customers can manage their accounts and find locations with Personnalit. Headquartered in Singapore, the OCBC (Oversea-Chinese Banking Corporation) has numerous international branches and offices. Their OCBC Bank launcher redirects customers to all the services that they need. Actions such as bill payments, transfers and location searches are all covered. You can also look at exchange rates, redeem your OCBC$ rewards and use EasiCredit. Our own CrackBerry App Store has the HSBC Hong Kong Business Banking launcher available. QNB offers their clients the eazymobile application. It supports account access, payments and transfers.You can also pay your Kahrama utilities and Qtel bills or even view a regularly updated news feed. 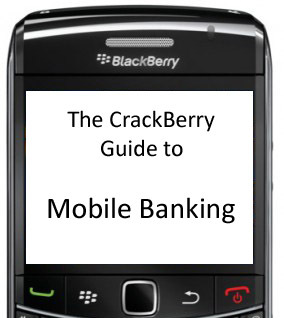 Thus completes the CrackBerry guide to mobile banking: part 1. This guide will be updated as new apps and launchers are released. If we have missed any apps or launchers, please let us know. Stay tuned for part 2 as we look at other mobile banking options.